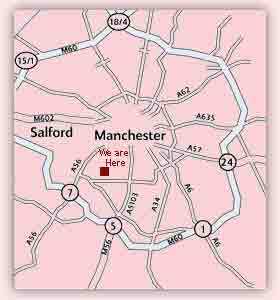 Take the Mancunian Way signed A57M Warrington, Preston (M61), Liverpool (M60/M62). Take the left slip road signed Stretford, Trafford Park, Chorlton to the roundabout. 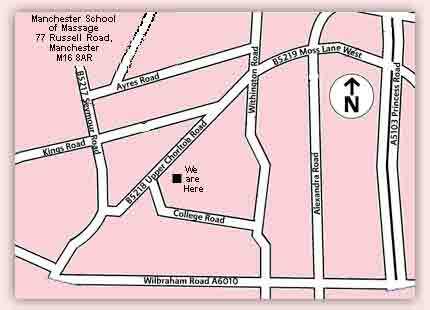 At the roundabout take the first exit B5218 signposted Chorlton and Whalley Range. Turn right at the third set of traffic lights at the Whalley Hotel onto Upper Chorlton Road. After 700 yards turn left onto Sylvan Avenue then immediate right and left onto Russell Road. Take the M62/M60 onto the M602 until the moterway ends. Follow the dual carriageway (A57). Just before the underpass take the left slip road signed Deansgate, Whalley Range, Old Trafford to the roundabout. Take the third exit, B5218 signposted Chorlton, Whalley Range. Turn right at the third set of traffic lights at the Whalley Hotel onto Upper Chorlton Road. After 700 yards turn left onto Sylvan Avenue then immediate right and left onto Russell Road. Follow the M56 to the end signposted A5103 Manchester. Proceed straight ahead along Princess Road A5103. After three miles turn left at the traffic lights onto Wilbraham Road signposted Stretford A6010 (at Whalley Range High School). At the second set of traffic lights turn right onto Withington Road. Turn left onto Dudley Road after two shopping parades..
From the M60 take junction 5 A5103 signposted Manchester. Proceed straight ahead along Princess Road A5103. 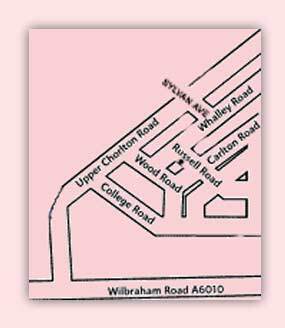 After three miles turn left at the traffic lights onto Wilbraham Road signposted Stretford A6010 (at Whalley Range High School). At the second set of traffic lights turn right onto Withington Road. Turn left onto Dudley Road after two shopping parades. Manchester Piccadilly station and Manchester Victoria station are 15 minutes by taxi. Buses 46 and 86 stop nearby on Upper Chorlton Road. Ask to be let off at Sylvan Avenue for the BUPA hospital. Walk along Sylvan Avenue then immediate right and left onto Russell Road.